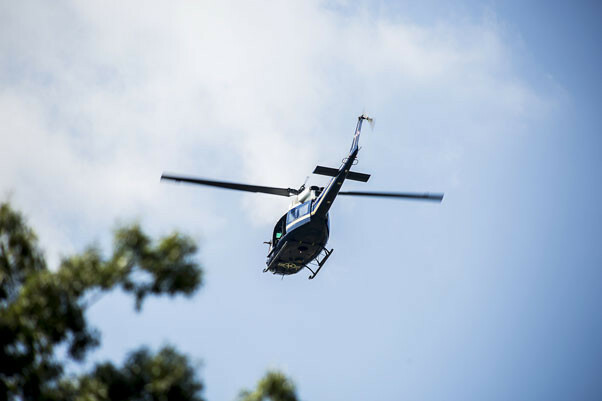 An UH-1N Iroquois helicopter is flown over the Memorial Amphitheater during the Vietnam Helicopter Pilots Association Living Tree Memorial Dedication at Arlington National Cemetery, Aug. 28, 2015. A living tree was dedicated to honor 5,000 Vietnam helicopter pilots and crew members, who were killed during the Vietnam War. ARLINGTON NATIONAL CEMETERY, Va. — Hundreds of Vietnam combat helicopter pilots, their guests and Gold Star families planted a tree in Arlington National Cemetery, Aug. 28, to commemorate the 50th anniversary of the first U.S. combat troops entering the Vietnam War. The spectators gathered before the tree dedication in the cemetery’s Memorial Amphitheater to remember the thousands of helicopter pilots and crew members, who lost their lives during the Vietnam War. The event began with a round of speakers within the amphitheater, including a keynote address by retired U.S. Army Maj. Gen. Carl H. McNair Jr. Guests afterwards followed along as the wreath was carried to the tree from the amphitheater. Above, four helicopters flew over in honor of the fallen as “Amazing Grace” was played on bagpipes. The memorial tree dedication was the largest gathering of pilots at a single commemoration event, with 1,000 expected, said Bob Hesselbein, president of the Vietnam Helicopter Pilots Association, which held a five-day meeting in Washington, D.C., which ended Aug. 29. Hesselbein said he met with the Family of 1st Lt. Carlos Pedrosa and talked about a picture he took of him in 1972 at Kon Tum Airfield, the day before his death. Pedrosa was buried at the cemetery and his granite marker has a Huey helicopter carved into it. More than 58,000 Americans were killed in action during the Vietnam War, and more than 153,000 were wounded. All told, 658 U.S. prisoners of war returned home alive from Southeast Asia, and as of 2014, 1,638 were still unaccounted for. There are roughly 7.4 million living Vietnam-era veterans, according to the Department of Veterans Affairs. A presidential proclamation signed in 2012 marked the beginning of a 13-year commemoration to honor the 50th anniversary of the Vietnam War, which will span through Nov. 11, 2025. Joint Base Myer-Henderson Hall, or JBM-HH, was made a commemorative partner of the 50th anniversary Vietnam War Commemoration for “supporting and honoring” Vietnam War veterans last year during the joint base’s annual retiree appreciation day event. JBM-HH Commander Col. Mike Henderson received a certificate signed by then-Defense Secretary Chuck Hagel and Gen. Martin E. Dempsey, chairman of the Joint Chiefs of Staff, marking the occasion.